Can't find the Generate Transfer Code dialog box to generate File Transfer script template? I know where the Generate Session/URL Code dialog is, under Session menu. I can't seem to find the Generate Transfer Code dialog? 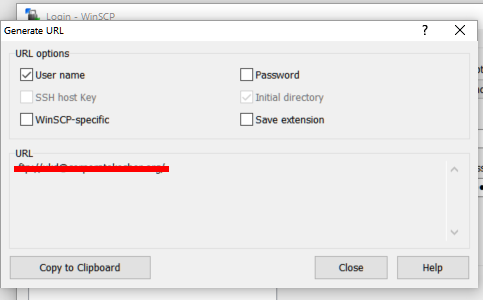 It doesn't specifically say where it is in the documentation, it just says "Use the Script tab to generate a WinSCP script template...". There is a script tab on the Generations Sessoin URL/Code dialog but it doesnt appear to be the same place as the Generate Transfer Code dialog? Found it. I was drag and dropping files nad the transfer settings box does not pop up. When I clicked Upload off the toolbar I got the transfer dialog box where I was able to find the script generator. I have version 5.7.7 build 6257. The "Generate code" function is available in the 5.8.x only. I see the same screen on version 5.13.3 and cannot locate the option to Generate Code in the Transfer Options screen. Is there something that I am doing wrong? Thanks for your response. Your tool has some wonderful capabilities. I actually clicked the Transfer Settings button. I am still not able to find the option to generate code based on the actions I am taken. I am definitely missing something. Let me know if there is some setting I am not seeing. Please post a screenshot of what you are doing. I have the same issue with generating code using the Transfer Settings menu, I am unable to find the Generate Code option. I am using version 5.13.4. No, Transfer Options dialog is the one linked in my post. The dialog linked in your post also doesn't have a Generate Code option. It does have a button to open the Transfer Settings dialog, which is the one I noted that also doesn't have such an option. For the others also struggling to locate this feature, I was able to figure out how to at least get a template to work from. Not quite as easy as the implied feature that a specific action can be generated to code, but pretty dang easy and more than enough to work with to avoid this unproductive documentation loop. In the Commander view, go to "Session" > "Generate Session URL code" > "Script" tab , then select the type of template you're after (script, batch, command line). You will just need to edit in the specific commands you wish to execute (as illustrated in the template by "Your command 1" and "Your command 2") which are well documented to be able to create by hand without the convenience of recording them from an actual UI action.